Fl.Ob.Cl.ASax.Bsn / Hn.Tpt.Tbn. / Timp. Karnatakamalika was commissioned by the University of Michigan Bands in celebration of the university’s bicentennial, as well as a consortium of institutions organized by Courtney Snyder. It received its premiere by the University of Michigan Concert Band, conducted by Courtney Snyder, on December 6, 2017, in Hill Auditorium in Ann Arbor. Karnatak music—the “classical” tradition of South India—has been enormously impactful in my musical life. I was instantly entranced by my first exposure in an ethnomusicology course I took in my undergraduate years at Harvard, and after graduating in 2009, I received a John Knowles Paine Fellowship to study Karnatak singing, theory, and the veena (a stringed lute, cousin to the sitar) for a year with 9th-generation virtuoso Karaikudi S. Subramanian in Chennai, India, the epicenter of Karnatak musical life. Since returning to the United States, I have traveled back to Chennai on three separate occasions for study and additional practice, and I’ve brought my research on Karnatak music to American audiences with presentations at national conferences and publications in scholarly journals. More importantly, however, my experiences in India have deeply transformed my musical sensibility and my life more generally. When Courtney Snyder at the University of Michigan asked me to write a piece specifically based on Indian music, I was only too excited to take on the challenge. While Indian influences pepper almost all of my works written since my time living in Chennai—without conscious intent, they have organically flowered in my compositional voice—Karnatakamalika is one of my only works to thoroughly adapt Karnatak musical language to Western instruments and performance practices. I have long harbored skepticism towards self-conscious attempts at musical “fusion”—while musical grafts can be operationally successful, the patients rarely survive the procedure. Western and Indian musicians have long held mutual fascination with the others’ art forms, and while their points of convergence (diatonic tonal system, twelve chromatic steps in an octave, harmonic primacy of the perfect fifth) invite ample opportunity for communication, their points of divergence yield very real systemic and philosophic hurdles (notated vs. oral transmission, through-written vs. improvised practice, twelve-tone quantization vs. access to the full microtonal spectrum, compositional and performative license vs. absolute stricture of raga tradition, harmonic change vs. harmonic stasis, and so on). With the weight of this discourse in mind, I set out to write a work not of fusion but of translation. Karnatakamalika is a Western composition, period, in which I render the forms, techniques, and sensibility of Karnatak musical practice in the language and performative traditions of Western notated music. 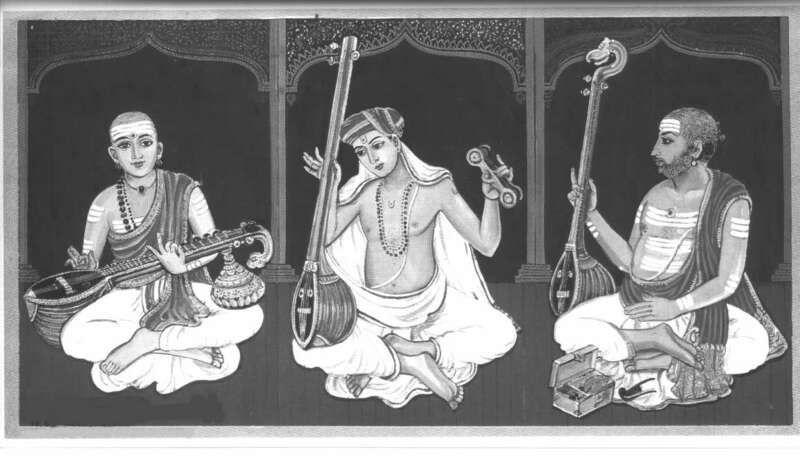 The title “Karnatakamalika” literally translates to “garland of Karnataka,” a reference to the common Karnatak form of “ragamalika,” or “garland of ragas,” a classification which is reserved for those uncommon works that dare to combine multiple ragas (scales/tonal systems) within a single work. In a sense, all of Western tonal practice is built on “garlands”—of harmonic zones, of disparate influences, of timbral and dynamic shadings—and I thought it most fitting that a Western work steeped in Indian influence would represent a gathering place for quintessential Karnatak features. With this work I have two ambitions: (1) to provide performers and audiences with an accessible window into the unbelievably rich world of Karnatak music, as well as (2) to stand alone as a successful piece of music in its own right, without the necessity of explanatory blather. Karnatakamalika consists of three movements, performed continuously without a break, that conform to the common Karnatak structure of “Ragam-Tanam-Pallavi.” Ragam refers to raga alapana, a rhythmically free, melodic introduction that explores the full range of expression in the raga; tanam is a rhythmically driving but metrically-flexible form based on the strumming technique on the veena; and pallavi is a strict compositional section set within a particular raga and tala (metric cycle). In traditional Karnatak practice, the raga alapana and tanam are entirely improvised, and while the pallavi is pre-composed, it nonetheless offers several points at which the performers can interject improvisation within the form.